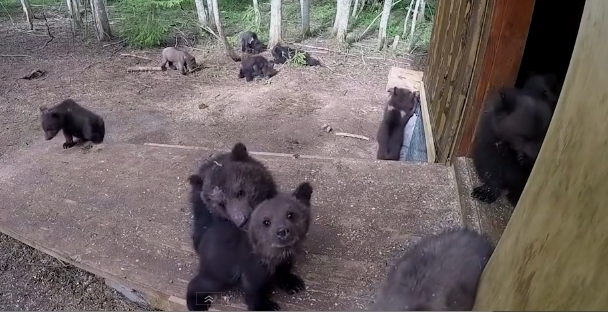 These 13 orphaned bear cubs have had to grow up in a rehab center, without their moms to teach them about the great outdoors. These baby bears are now in the expert care of staff at the International Fund For Animal Welfare's (IFAW) Orphan Bear Rescue Center in Bubonitsy, Russia, where they're learning how to survive in preparation of being released out in the wild. Recently the cubs got a chance to explore the woods and practice being outside on their own. They practiced their climbing and balancing ... all while looking totally adorable. Brown bears in Russia face threats including habitat loss and hunting — some of these cubs may have lost their mothers to trophy hunters who left babies to starve in the wild. Some of the cubs at the rehab center arrive when they're only days old. Around the world, safe wild places for bears are disappearing. Mankind is destroying bear habitat at an alarming rate and bears are being hunted all over the world. IFAW’s Bear Rescue Center in Russia has successfully returned more than 200 bears to the wild. Responses to "Rescued Bear Cubs Play Outdoors For The First Time Ever "